Quick, tell me what’s in the trunk of your car. Like most people, you probably have quite a hodgepodge of items in your car’s trunk. When my children were young, I had sports gear that they needed after classes finished, changes of clothes for them, various school supplies like extra sets of writing paper and marker pens, and whatever else made sense to transport for them. When I was in college, I used to do a lot of road trips to visit friends at other universities and so I kept a sleeping bag, basketball, volleyball, bowling ball, skateboard, foldable bike, and lots of other personal items in the trunk of my car. Indeed, there was pretty much no available space in my trunk, and when I went to the airport to pick-up someone that was coming to town, I’d have to insist that their baggage went with them into the car rather than fitting into the trunk (well, to my credit, I did have cords in the trunk that I could use to tie down luggage to the roof of the car). A trunk is a pretty handy thing. Sometimes you put old stuff in it. Sometimes you put new stuff in it. Sometimes it is jam packed to the gills, other times it as empty as can be. You might recall the famous comedian George Carlin that did a hilarious bit about the fact that we all have stuff. Our houses are full of our stuff. Our cars are full of our stuff. When we go on vacation, we take some of our stuff with us. At the hotel while on vacation we leave some of our stuff while we go on an excursion, and then make sure to come back to our stuff. Maybe it seems materialistic, but I’d say that we like our stuff and we want to make sure our stuff is safe and sound. Speaking of which, you might remember that when the idea of ordering stuff on the web was first coming to the attention of society, there were these wild predictions that we’d all need to get some kind of specialized box put at the front of our homes and that could be used to deliver stuff to us. You can’t fit that coffee maker that was ordered online into your conventional mailbox, plus legally your mailbox is only supposed to be used for certain stipulated purposes, and so the thought was that we would all purchase large sized, separately positioned lockboxes for our homes. These lockable containers would be on our front porch, or easier still for the delivery aspects would be to have the containers out near the street. A delivery could then happen by a delivery truck that would just pull up to the container, and by entering a code would open it and then place the shipment into the open space. The deliverer would then close the container and somehow lock it, either by its own automatic means or by the deliverer taking some kind of locking action. I remember predictions that there would be millions upon millions of these home-based shipping container boxes contraptions that would be sold within just a few years’ time. These containers had some potential downsides. Would they look ugly and turn our pleasant neighborhoods into a sea of commerce looking boxes, was one such concern. Another was how to secure the container itself. In other words, if you have this container thing sitting on your front porch, and if thieves realize that some nifty items are being placed into it, might the thieves just follow along after the delivery truck and haul away your entire container in their own truck? Presumably, they would take it to some dinghy warehouse and break open the container to then take your goods and opt to resell it on e-bay or elsewhere. When the containers approach fizzled, we all began to get used to just having delivery trucks place boxes of ordered items at our front door. But, this has the same thievery aspects associated with it. Furthermore, if you were to leave the delivered items at your door for a day or two, home burglars might reason that you are away and so they might come and break into your house looking for even better loot. Taking the thievery aspects out of it, having boxes of delicate items sitting at your front door also makes those boxes susceptible to the elements. The most hardened of cardboard boxes can still have troubles when dosed in several inches of rain. We’ve identified so far then that we want to get stuff delivered to us, and we aren’t keen on buying a special container to sit outside our house, and we don’t want to have stuff just dropped at our doors. What next? As you likely know, the next approach involved allowing a delivery to take place into your home. You’ve perhaps seen the experiment that Amazon has been doing of having deliveries occur into your home. You put a special electronic lock on your door, the delivery person uses an electronic code to open the door, they put the delivery into your house, you can see them on your in-house web cam, and they then are supposed to politely leave your house, not disturbing anything, and the door should be locked after they head-out. Some scratch their head about the idea of letting a delivery person into their home when the home is otherwise unoccupied. For many, entry into their home is a sacred act. They don’t like the idea of a stranger, even one that is authorized, coming into their homes. But, there are some people that think it’s a great idea. They love the idea that they can get a delivery into the safe environs of their home. What excitement to come home after a long day’s work and see that apparently Santa has dropped off some items you ordered. It’s like Christmas each and every day! The odds are though that the percentage of people that are going to use the in-home delivery method is relatively low. If that’s not a popular method, and if leaving stuff at your door is not desired, and if getting a container for outside your home is not fruitful, you might be wondering what other possibility exists. Answer: Use the trunk of your car. Think about this idea for a moment. Your trunk is a relatively safe place. You already keep all sorts of important items in there. Suppose you parked your car at the front of your home, and allowed a delivery to occur that gets placed into the trunk of your car. If the delivery could occur with some allowed remote unlocking of your car, you wouldn’t need to be nearby to receive the delivery. You could be in your house, sound asleep, and meanwhile a delivery comes up to your parked car, opens the trunk, drops in a package, closes the trunk, makes sure the car is locked, and voila, you now can get the item out of your trunk whenever you want. Cool. This car-as-container idea is handy too since presumably your car goes where you go. In other words, you drive to work and park your car nearby to your office. You are in the office for let’s say eight hours. During that time, you could potentially have something delivered to the trunk of your car. Indeed, you could have multiple deliveries possibly made to your trunk. When you finally get done at the office, you drive your car home and all of the neat new stuff you got delivered is right there in your trunk. Amazon recently made quite a news splash by announcing that they are going to provide in-car delivery services. There are other delivery firms that have been considering the same idea, but you’ve got to hand it to Amazon to be the first big-time proponent and announcer of this new, shipping delivery approach. It’s another reason for people to shop at Amazon. If it becomes popular, you can bet that other online firms and even brick-and-mortar firms will soon be offering the same kind of service (they will have to, for competitive purposes). 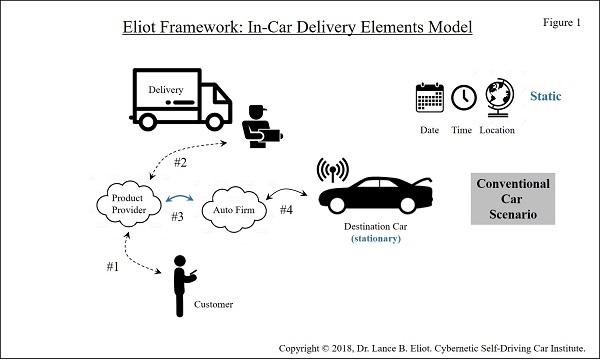 How does the in-car delivery work? Basically, the customer first downloads a special app, which for Amazon it’s the Amazon Key app and only usable by Amazon Prime members currently. The customer links their “product provider” cloud service (in this example, Amazon) with their connected car service such as OnStar. For certain models of cars (Amazon is doing this with certain newer models of GM and Volvo autos), the customer will be able to specify that they want to have a delivery done to their car. The delivery will be scheduled in a particular time window, of which Amazon is saying four hours for now and we’ll see if that gets tightened up, and when the deliverer arrives at the vehicle, the car will get unlocked by communicating to the connected car service, the deliverer than puts the item into the trunk, and either directly re-locks the car or the connected car services does so (with the approach now being that the deliverer is supposed to lock the car, but either way the connected service does so after some amount of time once the delivery has occurred, doing so as a fail-safe method). On the one hand, it’s pretty simple. I’d also say that there’s opportunity for things to go awry. With any such new service, there will likely be some hiccups and shake-out as it gets perfected. Your car is supposed to be parked in a public place that is readily accessed by the deliverer. I am sure there will be cases of people parking their car in a restricted area and not realizing that the deliverer can’t get to their car, such as in a gated community or in a private parking structure that doesn’t otherwise allow public entry. I am guessing there will be instances of people having their car parked in a bad area, and once the deliverer shows up, either some bad people try to steal from the deliverer, or once the deliverer drives away that those bad people might try to break into the car or maybe even steal the car. There are likely going to be circumstances when the deliverer finds the right car, and upon opening the trunk discovers there is insufficient space to put the package. This could be because the trunk is already full. Or, it could be that someone ordered a refrigerator and had it delivered to the trunk of their car (don’t underestimate dolts!). This also raises the question about the nature of trunks themselves. Some vehicles don’t have a true trunk and instead have an area in the body of the car that has a shield to try and cover the so-called trunk area. If the deliverer puts your boxes there, it is possible that any passerby will see the boxes that you have, which could either be an intrusion of your privacy, or again be a lure to break into your car. Further issues involve the status of the boxed item once it is in your car. Suppose the deliverer properly deposited it, but then the sun beats down on your car the whole day, and when you come out to get your ordered item, it’s a melted goo. There are lots of other “oddball” (some say “edge”) cases too. Suppose you have left Aunt Betty in the car, and the delivery takes place – should the deliverer interact with Aunt Betty or just open the trunk and put in the package? Suppose you’ve left a dog in your car (which you shouldn’t do), will that impede the deliverer? Should the deliverer actually report you to the authorities if they find the dog stuck inside your car? Suppose the deliverer opens the trunk and finds fifty pounds of illegal drugs, what should they do? Suppose you’ve illegally parked your car. Should the deliverer still try to make the deposit. By the way, where is the deliverer going to park the delivery truck while delivering to your car? Will the delivery car sit double-parked in the street while trying to make the deposit? We could be encouraging dangerous driving behavior by this method of shipment and delivery. Suppose your car is parked in a manner that getting the trunk is nearly impossible (it’s butted up against a wall or some other car). What then? Will the deliverer find the right car? In theory, they should, since they are presumably going to have a description of the car, plus the license plate info, plus the connected car system which will unlock the car (in spite of those aspects, I suppose it’s still possible that deliveries to the wrong car might happen). As a twist, suppose that I offer to you, my office colleague, that you can use my car to get your delivery today. In this case, will whatever security provisions allow this, or would the fact that you are the customer, and you are specifying a car you don’t own or control, would that be permitted or not accounted for. Some wonder about the safety factor of this too. We are usually all watching for suspicious people near cars. If someone looks like they are wearing a delivery uniform, will we now accept that they might be standing at your car and trying to do a delivery (or might be masquerading as such to break into it)? The 4-hour time window is another interesting facet. Suppose you park your car, intending to leave it for the four hours. But, an emergency occurs, and you opt to use your car. Will the deliverer get notified, which this also brings up how often your car will be beaming its location to the deliverer? Privacy experts worry that people will be giving up their routine of where they park their car, which could be used for maybe advertising purposes (the provider starts flooding you with ads for that coffee shop across the street from where you seem to be normally parking your car), or worse. We’ll also need to deal with things like breakage. Suppose the delivery truck accidentally brushes against your car while trying to make the delivery. And/or, suppose the human deliverer accidentally bangs your car while making the delivery. Suppose the deliverer shoves the package into the trunk, and you had your precious collection of fine china in the trunk, which now is crushed by the package. Or, maybe you look in your trunk and find the package there, but the fine china is now missing (did the delivery person take it?). In short, there will be lots and lots of exceptions, and we’ll have to see how much it tarnishes the whole notion of the approach. If the first people that use the service get big news coverage that something went awry, it might force the firms wanting to do this to go into a retreat. The retreat might involve being more selective about who and what gets delivered, or maybe that only certain areas get deliveries, etc. Hopefully, whatever maladies occur, it won’t end-up killing the goose. Generally, this idea of using the trunk of our cars as a shipment destination seems appealing and I would anticipate it will become quite popular. What does this have to do with AI self-driving cars? At the Cybernetic Self-Driving Car Institute, we have already been anticipating the in-car delivery prospects and have been doing various development aspects accordingly (yes, yet another edge problem to be solved for AI self-driving cars). Let’s consider why an AI self-driving car as an in-car delivery is any different than a conventional car. Before we jump into the whiz bang aspects, keep in mind that the AI self-driving car could act like it is a conventional car, meaning that it simply sits and waits for a delivery to occur. In this mode, it does not exercise any of its AI self-driving capabilities. I want to mention this so that it is clear cut that the AI self-driving car can still be used as a conventional car for the in-car delivery purposes. But, with its “super powers” the AI self-driving car can do more. First, a conventional car is going to be stationary at a fixed location for the time window that the shipping delivery is supposed to occur. As shown in Figure 2, the AI self-driving car does not necessarily need to be sitting around. Keep in mind that the AI self-driving car essentially has a “driver” sitting in it, ready for use, at all times. As such, the AI self-driving car could opt to go toward the delivery vehicle and meet it at some mutually agreed and convenient place. Suppose you parked your car at your company private parking structure. While you are at the office, your AI self-driving car leaves the parking structure, and via electronic communication with the delivery cloud, it finds a place that is good for both the deliverer and the AI self-driving car. The AI self-driving car comes up to the delivery truck, and they both park momentarily for the human deliverer to then put the package into the AI self-driving car. The AI self-driving car then drives back to your company parking lot, parks, and waits for you to next make use of the self-driving car. I realize that some of you will say that why even have a human deliverer, and though yes at some future time we might have some more robotic way to do this, in the nearer term it seems reasonable to assume that there is still a human delivery person involved. 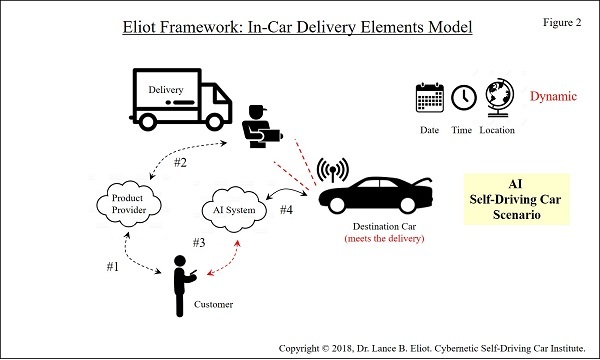 Whether the human deliverer is also driving the delivery vehicle will be a second question, in the sense that the delivery vehicle might also be an AI self-driving vehicle. This would certainly change the dynamics too of who could be a human deliverer, since they might not need to have a driver’s license anymore for the purposes of driving the delivery vehicle. You might be wondering why does the AI self-driving car go to the deliverer, and instead why not go to say the warehouse where the goods are stored. The AI self-driving car could certainly go to a warehouse and pick-up a package, but let’s assume for the moment that it is a longer drive, and that instead there are these delivery vehicles acting as a distributed method of having goods floating around. It would likely make more sense for the AI self-driving car to meet with the floater, rather than having to make a trip to a fixed location warehouse. Another subtle difference of the conventional car versus the AI self-driving car involves what happens after the delivery occurs. Suppose you want to get a shipped item to your children at their school, and so your AI self-driving car goes to their school (after having met with the deliverer), your children get the item out of the trunk, and then your self-driving car comes to your workplace to wait there until you are done for the day. The point being that the AI self-driving car can act in a mobility fashion, doing so both prior to the delivery and at post-delivery. This capability also changes the static nature of the 4-hour time window for delivery into instead providing a flexible and dynamic time alignment. Nearly at any time, the coordination and synchronizing of the deliverer and the AI self-driving car can occur, thus, there might be an agreed overall window of general time and location, which could be firmed-up and allow then that the AI self-driving car doesn’t have to be pinned down to a static location and time per se. Let’s also consider some other ramifications of using the features of an AI self-driving car. You could potentially turn your AI self-driving car into your own delivery vehicle. Suppose that a delivery of several items for people on your block are available from the true delivery vehicle, and in coordination with your neighbors, your AI self-driving car picks those up from the true delivery vehicle, and then your AI self-driving car goes to each house in your neighborhood to allow your neighbors to get their respective item out of your trunk. Yet another difference involves how your conventional car interacts with the product provider. It could be that rather than using a connected car service per se, you are able to control your AI self-driving car via the auto maker cloud. You then might be directly coordinating with the product provider. No need to necessarily have the connected car service acting as a middleman. When the deliverer comes to a conventional car, the conventional car might not have any ability to signal to the deliverer that they have found the correct car. For an AI self-driving car, it could become conspicuous by turning the headlights on-off, or honking the horn, etc. This might help the deliverer to more readily find your car and also increase the odds of getting the package to the correct car. The AI self-driving car can also use its sensors to the advantage of undertaking the delivery. With the cameras on the self-driving car, it could visually record the activity of the deliverer, which might be handy in case of any disputes. Your AI self-driving car could also live stream video to you, and thus you could watch as the deliverer makes the delivery (similar to the idea of having a web-cam in your house for watching in-home deliveries). Do we want to use our cars as a place to store our stuff? That’s the fundamental question. Since we already do keep stuff in our cars, it makes sense to allow for shipments to be delivered to our cars. While we perceive our homes as sacred ground, I’d guess that most people perceive their trunk as less hallowed. The convenience of having something delivered to your car is quite appealing. Adding into the mix the capabilities of AI self-driving cars would seem to further up the ante. We’ll need to see whether people accept the idea of in-car delivery for conventional cars, and if so, I’d suggest that the added benefits of doing so with an AI self-driving car might just knock off their socks. By the way, those are socks that were delivered to the trunk of your car.